Life has just validated so many things I strongly tried to get myself to believe in and internalize in me after the many things that have happened in my life. I fought so strongly to get what I thought was the best for me... and what I wanted so much in life. And when I saw that it seemed so possible and that everything was in place... there was something missing... Like a missing link... I would wonder why things were just not working out when it seemed like an ideal situation. And when it seemed like it would never work out, life pushed me away from everything... force-pushed... I had to move away into a new chapter of life that probably thought me the most I've ever learnt. I met the most interesting people, had the most interesting experiences, got to see the world in a whole new light, learnt that there was far more to my potential than I was ever exploiting and what not! Now many months down the line, I feel I am such a strong person - both in my beliefs and in my outlook towards life. And now, I hear that what I wanted a while ago seems all the more probable to happen and could happen. But only now, I don't know if I want it anymore. I don't know if I want to walk down that path and fear that it would work towards unlearning all that I have learnt in this phase of my life. 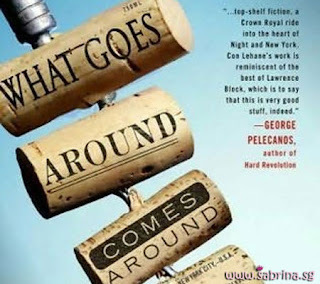 But whatever said and done, this has made me all the more sure of what I am doing in life and of course, "What goes around, comes around..."
Ha ha! Well dude... There are points in life when we're forced to think like one! lol..